The earthen dam has been constructed for long time part. They are constructed with the natural materials. The constructed of an earth dam, up 1930 was based mostly on one experience. But now with an advanced knowledge of soil mechanics, these dams are designed and contracted on a scientific basis with the increased knowledge of the behaviour of soils and the development of the earth moving machinery. Earth dams can be constructed economically even up to the height of 250 to 300m. Claire material-black cotton soil, silty clay loams etc. for hearting and cutoff. Sandy material-murmur, soft rock, sandy silt for the casing. Rock-for pitching, riprap, rock for masonry etc. Sand –for filters, seepage, seepage drains and masonry. Cement, steel, lime and other building materials in small quantities for the construction of spillways, outlets etc. Homogeneous sections are constructed with one type of soil. The soil should have frictional resistance as well as low permeability and should be available in required quantities near the site such section are not in common practice. Zone types of earth dam are very common nowadays. The dam section is divided into two parts. Hearing or case forming the central impervious zone. The casing or outer shell forming the upstream and downstream casing zone covering the hearting. The hearing is made of clay soil such as black cotton soil. It provides water tightness to the dam against seepage the casing is made of sand gravel or murmur, soft rock etc. it provides stability to the dam section. In the most of the site, clayey silts, murmur, gravelly deposits are available and all such local materials can be used in zoned type embankments. A gravity dam is so called because it is designed in such a way that its own weight resists the external forces acting on the dam so it needs a good foundation. It may be built to any height. It is made of stone masonry or concrete. 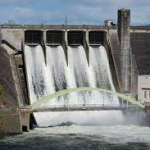 The sluices or opening extend from upstream face of the dam to downstream face of the dam to clean silt or to supply the water below the dame side to decrease the peak of the flood in the reservoir for the safety of the dam. It is more durable, stable than earth dams. I require less maintenance cost than other types. It is best suited in narrow valleys [V gorges] with the rocky bed.